Prep. Time: 15 min. | Cooking Time: 15 min. Chop cabbage and cauliflower into large pieces. Grate 1 cup of cabbage and 2 cups of cauliflower into a bowl. Add 2 cups besan (chickpea) flour and a pinch of salt and pepper. Mix well by hand to form a smooth dough. Shape mixture into kofta balls. Peel and finely slice 1 inch piece of ginger. Measure 2 tsp Rogan Josh curry paste. Open 1 can coconut cream and roughly chop 1 onion. Place tomatoes into a blender. Add ginger and Rogan Josh curry. Add chopped onion. Add 1 can of coconut cream. Add 1 tsp turmeric and 1 Tbsp garam masala. Blend ingredients well to form a smooth sauce. Add 1 Tbsp agave. Place 2 cups of basmati rice into a saucepan with 2 cups water. Add 5 cardamon pods. Cover and cook for 12 mins. Add 1 Tbsp vegetable oil to a hot frypan. Add kofta balls and fry each side till golden brown. Meanwhile slice 1 chilli and set aside. Turn kofta balls when golden brown. When cooked both sides, add the blended tomato mixture. Continue to simmer over medium heat for 5 minutes. When the rice is cooked, add 2 cups of frozen peas. Mix well and set aside. Turn the kofta balls and serve when ready. 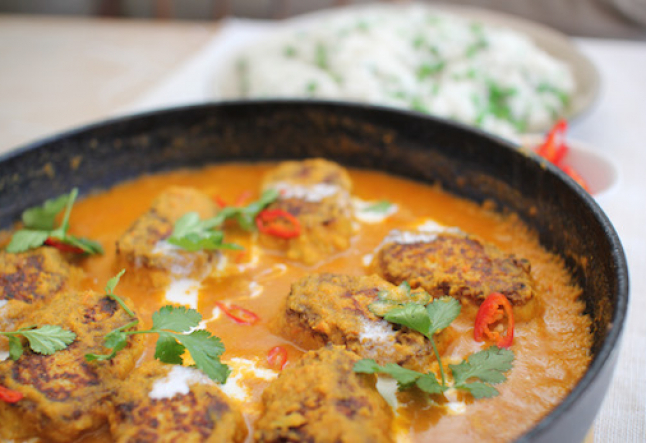 Topped with sliced chilli, coriander and coconut cream.